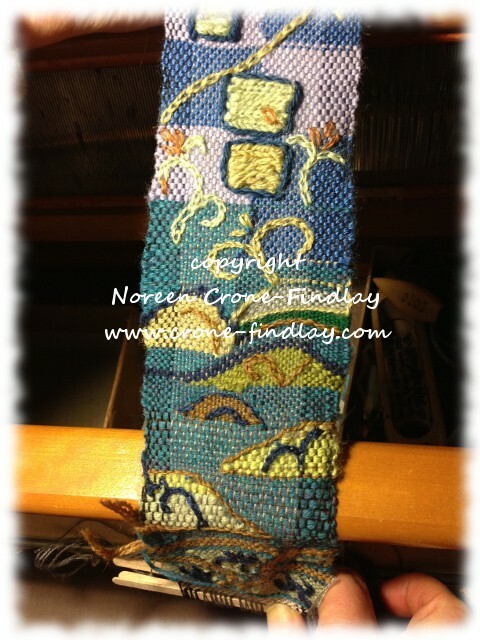 I had been mulling over weaving a new Mermaid tapestry for quite awhile, and had woven narrow bands on my Structo 4 harness loom as well as my rigid heddle box loom, to start. Because there are a few things to know about weaving tapestry on a triangle loom, I made a short video as part of the video about the Blue Butterfly Mermaid tapestry – it’s close to the end of the video. I used other looms to weave the other elements of the tapestry: a hexagon woven in copper wire on the Lily Speed o Weave Loom, narrow bands woven on the 4 harness vintage Structo loom, narrow bands woven on a rigid heddle box loom, 2 small triangles woven on the 7 inch Lil Weaver loom from Dewberry Ridge Looms and some tatting. The hair is twisted cord made with a cord twister from Lacis.com. 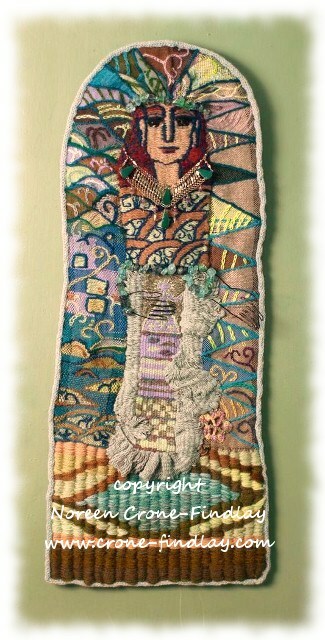 For the last few months, I have been working on a very large mixed media tapestry in my series of ‘Woven Women’. This one is called: ‘Essence’. She’s over 6 feet tall, and has about 2 feet of warp strands hanging below the lower edge, so she’s about 8 feet tall in total. I also used: A rigid heddle loom, a narrow band weaving loom, peg loom, weaving sticks, Star Loom, tatting and wire work. Happy Weaving, and here’s to Essence, however it reveals itself (or in this case: Herself).